Soil Preference: Prefers moist well drained, cultivated soil. Fairly adaptable but does not like soggy soil. The Common Horse Chestnut leafs out early in spring with light green leaves. The blooms in early spring are spectacular, peaking by mid May. After the leaves have fallen, a very attractive branching form is exposed, with spreading branches turned up at the ends. The wood tends to be soft and weak, sometimes breaking limbs under the weight of heavy snow. Prune crossed or wayward interior branches to encourage a strong structure. Horse Chestnut bleeds extensively and should be pruned midsummer after new growth has matured and bloom period is done. Common Horse Chestnut is very susceptible to leaf scorch and should not be planted in hot, dry, windy sites to minimize the problem. The tree will be healthiest in cool climates. Very tolerant of urban air pollution, somewhat tolerant of aerosol salt doing quite well in coastal environments. Flowers attract bees. Shape: Upright oval to rounded crown, outer branches often droop. Soil Preference: Prefers moist well drained, cultivated soil. Fairly adaptable. The ‘Baumannii’ variety of Common Horse Chestnut delivers two big improvements. The double flowers are impressive and last longer than the single, blooming a bit later than Common Horse Chestnut. And NO fruit is produced! No big conkers littering the lawn is a big plus. It is also a bit taller and not quite as wide. ‘Baumannii’ develops a tap root so it very difficult to move once established. The wood tends to be soft and weak, sometimes breaking limbs under the weight of heavy snow. Prune crossed or wayward interior branches to encourage a strong structure. Horse Chestnut bleeds extensively and should be pruned midsummer after new growth has matured and bloom period is done. It is also very urban tolerant, somewhat drought and salt tolerant, and makes an excellent boulevard or specimen tree. Soil Preference: Prefers moist, fertile, well drained, acidic soil. Tolerates average soil. The Red Horse Chestnut is a hybrid between the common horse chestnut and the red buckeye. Carnea is more drought tolerant and more resistant to leaf scorch and mildew than the common horse chestnut, with a bit more rounded growth habit. The crown is broad and symmetrical, making an excellent specimen or boulevard tree. It may take up to ten years for a Red Horse Chestnut to bloom. The blooms attract bees and hummingbirds. The fruits attract squirrels. Red Horse Chestnut branches tend to grow downward or droop as they mature, pruning of lower branches may be necessary to allow clearance. The wood tends to be soft and weak, sometimes breaking limbs under the weight of heavy snow. Prune crossed or wayward interior branches to encourage a strong structure. Horse Chestnut bleeds extensively and should be pruned midsummer after new growth has matured and bloom period is done. Trunk bark may crack if exposed to direct sun, or winter sun in the north. Allowing the drooping branches to shade the trunk solves the summer problem, trunk wrap in winter in the north. Red Horse Chestnut is moderately tolerant of soil and aerosol salt. Shape: Upright rounded dense crown, outer branches often droop. Soil Preference: Prefers moist well drained soil. Fairly adaptable. Blooms: 4-6” erect, full upright clusters of white with pink flowers in spring into summer. Fruit: 1-3” round, smooth brown and green capsules maturing in October and persisting in winter. The showy white blooms of Indian Horse Chestnut are at least 6” long on upright panicles, with over 300 tiny flowers each. The bloom spikes appear in April, opening in May into June, after most trees and shrubs have finished flowering. Not only does this extend blooming in the landscape, but is ideal to encourage insect pollination of the tree with scarce other blooms for the bees. 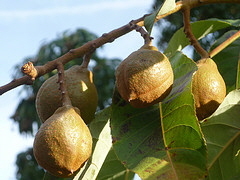 The fruit, or nut, is produced in huge quantities. The very large leaves are quite attractive, opening in very early spring. Indian Horse Chestnut is fairly adaptable, tolerating clay or sand and slightly alkaline or acidic soil. Does not tolerate aerosol salt well. The wood tends to be somewhat soft and weak, Prune crossed or wayward interior branches to encourage a strong structure. Horse Chestnut bleeds extensively and should be pruned midsummer after new growth has matured and bloom period is done.